Gov. Bill Walker has a big decision to make: whether to continue his campaign in the wake of former Lt. Gov. Byron Mallott’s resignation. Alaska Democratic Party leaders would like to see him step aside. Walker’s name will be on the ballot this fall – alongside the name of Byron Mallott. But he could stop campaigning. This would effectively turn the campaign into a two-way race between Republican Mike Dunleavy and Democrat Mark Begich. Alaska Democratic Party Executive Director Jay Parmley wants to see that happen. And that’s something Democrats would have liked the independent Walker to do all year. “Any way that this could become a two-way race would change the dynamic, even with three weeks to go,” Parmley said. If Walker were to drop out, Parmley said, there’s still enough time for the campaign to get the word out. “While of course it’s not ideal that names remain on a ballot, that’s just the way it is, and we would work with that appropriately,” he said. Walker campaign manager John-Henry Heckendorn told the Associated Press that Walker was already in talks with Begich before Mallott’s resignation occurred. 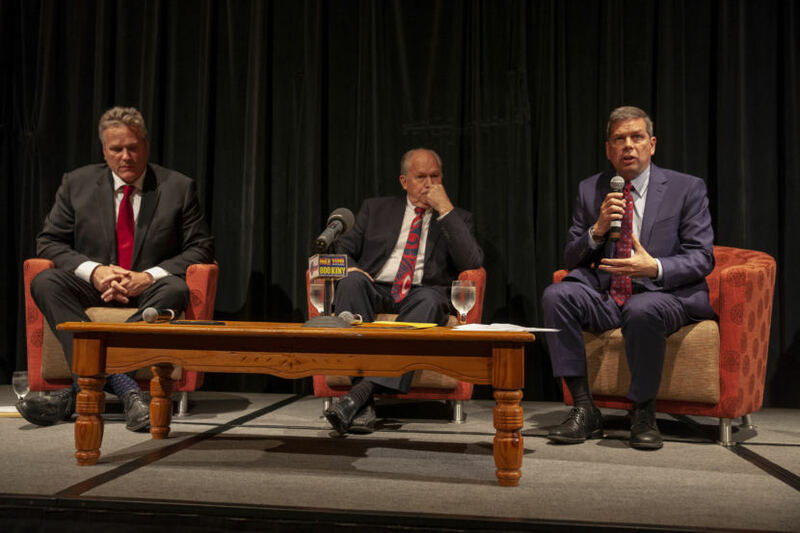 The talks focus on a “path forward for Alaska” and concerns about Dunleavy. There are reasons for Walker to make a decision quickly. One is the Alaska Federation of Natives convention beginning Thursday. It could provide a launching point for the rest of the campaign with one of the state’s most important organizations. A second reason is the fact that absentee ballots – including those from the military – have already been mailed in. Every day that passes without a change in the race locks in more votes for Walker and Mallott. And a third reason to make a decision is the beginning of early voting on Monday. Another Democrat who would like to see Walker end his campaign is Hollis French. He was Mallott’s running mate four years ago and withdrew when Mallott joined Walker’s campaign. That change occurred after Mallott and French won the Democratic nominations but before the deadline to withdraw. That allowed Walker and Mallott’s unity ticket to appear on the ballot. While that’s not possible this year, French said Walker faces a similar decision to the one that the Democrats faced four years ago. “With three weeks to go before the election, and with the resignation of his right-hand running mate, the governor I think is left with doing the right thing for the state, which is to take a step backwards and make the sacrifice that he asked many of us to make four years ago, for the good of the state,” French said. Ivan Moore has polled Alaskans on the governor’s race three times in the past month. The last poll was done Friday through Sunday – before the Mallott news broke. Moore found that Dunleavy was 17 points ahead of Walker and Begich in a three-way race, but only 7 points ahead of each in two way races. Moore spelled out what he sees as the most likely result unless there’s a change. Moore said Mallott’s resignation is a “body blow” to Walker. Moore also said Walker dropping out wouldn’t be enough for Begich to win, since polling shows about a third of Walker supporters prefer Dunleavy to Begich. But he said that if Walker and Begich found a way to somehow team up, they might bring both of their constituencies together. Moore doesn’t know how that would happen. Moore noted that Walker and Begich are tied after trading places in the previous polls. Walker is scheduled to speak Thursday at AFN. Mallott is no longer scheduled to speak.